It started with loaves then sweet buns and now, the towering confection welcoming the guests to your reception – literally the sweetest part of your wedding — the cake. When it comes to cakes, the couple’s personal tastes dictate the design and colors and that there is no visible trend nowadays. Most of wedding cake designs are simple yet elegant while some are over the top depending on the couple’s wedding theme and personalities. The cost of the wedding cake depends on the size, number of layers or tiers and the design. The bigger the cake, the more expensive it is. However, there are small cakes which are also expensive because they feature intricate designs. Cakes with fondant icing are pricier than those iced with butter cream. 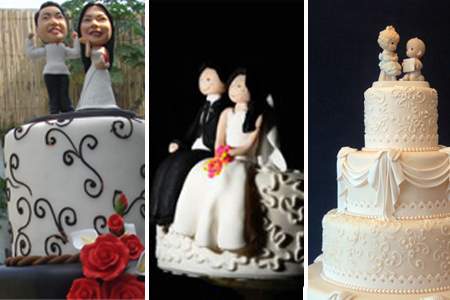 On the average, a medium-sized wedding cake costs around P10, 000. Fondant — is definitely a buzzword when it comes to cakes. Fondant is a type of icing made of sugar, corn syrup, and gelatin rolled out with a rolling pin and draped over a cake. It gives a smooth and somewhat shiny finish to your cake. This could come in different flavors and is suitable for heavy cakes. 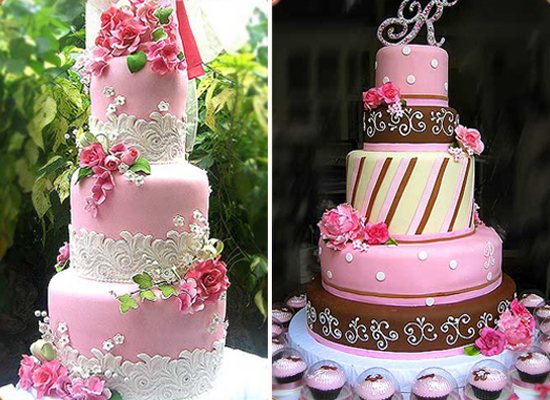 Buttercream — is another type of icing which was widely used in cakes before fondant became popular. It is made from butter and has a smooth and creamy consistency. Buttercream icing easily melts in extreme heat so make sure that the cake is refrigerated before it is displayed in the reception. Ganache — is a type of icing or filling. It is sweet and rich, denser than mousse but less dense than fudge. It is made of chocolate and heavy cream. Marzipan — is a paste made of ground almonds, sugar, and egg whites. It is usually used to mold the edible flowers on the cake. Butter-based cake — Butter-based cakes use butter-based cream instead of fresh cream which make them remain soft and moist longer. Examples are: pound cake, fruitcake, banana cake. Sponge cake — A sponge cake is lighter and less dense than a butter-based cake because it is egg-based. This type of cake works best with buttercream or marshmallow icing. Examples: chiffon and sponge cakes. Nowadays, almost anything can be used as a cake topper. It can be fresh flowers, bride and groom statues in all shapes and sizes, sugar flowers and crowns/tiaras are just some examples though having no topper is also okay. Make sure that the topper jives with the over-all look of the cake and with your motif as well. 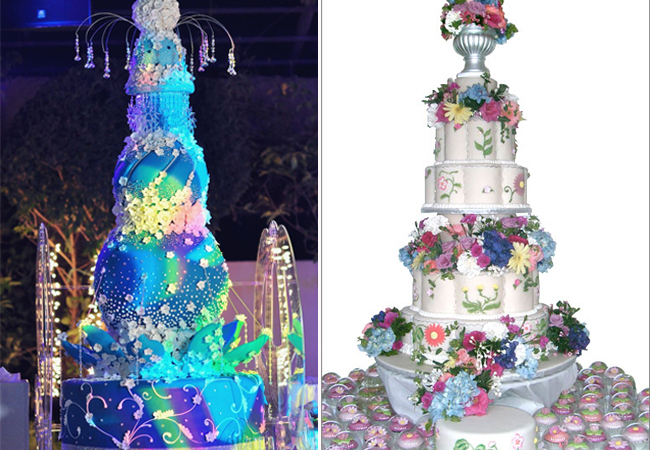 If you’re still having trouble envisioning your wedding cake, then take a cue from your wedding theme or motif. You could have the colors and the decors incorporated in your cake. There have been brides who had the embroidery or pattern of their gowns repeated on their cakes. Make sure to schedule a cake-tasting session before the wedding. Though the cake is not really served to guests in Filipino weddings, you may want to make sure that you and your sweetie will sink your teeth in an equally sweet creation. Don’t hesitate to tell your cake designer what you want. Express yourself through your cake. For more wedding cake inspirations, visit Kasal.com Wedding Photos – Cakes.